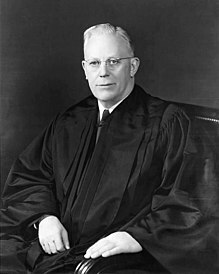 Earl Warren (19 March 1891 – 9 July 1974) was the 30th Governor of California (1943–1953) and 14th Chief Justice of the United States (1953–1969). I am unalterably opposed to any species of vigilantes or to any other extra-legal means of a majority exercising its will over a minority. It was not in keeping with our American concept of freedom and the rights of citizens. He has the right to remain silent, that anything he says can be used against him in a court of law, that he has the right to the presence of an attorney. Perhaps the most tragic paradox of our time is to be found in the failure of nation-states to recognize the imperatives of internationalism. We have consistently denied the constitutionality of measures which restrict the rights of citizens on account of race. There can be no doubt that restricting the freedom to marry solely because of racial classifications violates the central meaning of the Equal Protection Clause. I believe the preservation of our civil liberties to be the most fundamental and important of all our governmental problems, because it always has been with us and always will be with us and if we ever permit those liberties to be destroyed, there will be nothing left in our system worthy of preservation. They constitute the soul of democracy. I believe that there is grave danger in this country of losing our civil liberties as they have been lost in other countries. There are things transpiring in this country today that are definitely menacing our future; among which are the activities of Mayor Hague and other little Hagues throughout the country. These activities are so basically wrong and so menacing to our institutions that every citizen and particularly every public official should oppose them to the limit of their strength. We hear about constitutional rights, free speech and the free press. Every time I hear these words I say to myself, "That man is a Red, that man is a Communist." You never hear a real American talk like that. I am unalterably opposed to any species of vigilantes or to any other extra-legal means of a majority exercising its will over a minority … I believe that if majorities are entitled to have their civil rights protected they should be willing to fight for the same rights to minorities no matter how violently they disagree with their views. Further, I am convinced that this is the only way they can be preserved. I have since deeply regretted the removal order and my own testimony advocating it, because it was not in keeping with our American concept of freedom and the rights of citizens. Whenever I thought of the innocent little children who were torn from home, school friends, and congenial surroundings, I was conscience-stricken. It was wrong to react so impulsively, without positive evidence of disloyalty, even though we felt we had a good motive in the security of our state. It demonstrates the cruelty of war when fear, get-tough military psychology, propaganda, and racial antagonism combine with one's responsibility for public security to produce such acts. 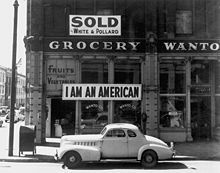 I have always believed that I had no prejudice against the Japanese as such except that spawned by Pearl Harbor and its aftermath. Most people consider the things which government does for them to be social progress, but they consider the things government does for others as socialism. As quoted in Politics and Policies : The Continuing Issues (1970) by Duane W. Hill, p. 170. The abhorrence of society to the use of involuntary confessions does not turn alone on their inherent untrustworthiness. It also turns on the deep-rooted feeling that the police must obey the law while enforcing the law; that, in the end, life and liberty can be as much endangered from illegal methods used to convict those thought to be criminals as from the actual criminals themselves. To summarize: Americans have one of the greatest legal systems, but not a monopoly of the sense of justice, which is universal; nor have we a permanent copyright on the means of securing justice, for it is the spirit and not the form of law that keeps justice alive. 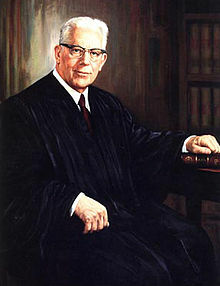 In "The Law and the Future," in The public papers of Chief Justice Earl Warren (1959) edited by Henry M. Christman . I always turn to the sports page first, which records people's accomplishments. The front page has nothing but man's failures. A society, in the process of moving forward, often appears to be tearing itself apart. Certainly, an age of rapid change, such as ours, produces many paradoxes. But perhaps the most tragic paradox of our time is to be found in the failure of nation-states to recognize the imperatives of internationalism. Paraphrased variant: Everything that I did in life that was worthwhile, I caught hell for. President Dwight D. Eisenhower upon appointing Warren as Chief Justice of the Supreme Court. President Dwight D. Eisenhower on his appointment of Warren to Chief Justice, attributed in New York Times obituary, July 10, 1974. Warren is considered a dangerous and subversive character. 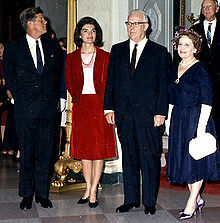 He is an apparent sympathizer with the Communist Party and has rendered numerous decisions favorable to it. … Warren is a rabid agitator for compulsory racial mongrelization and has handed down various decisions compelling whites to mix with negroes in the schools, in public housing, in restaurants and in public bathing facilities. He is known to work closely with the N.A.A.C.P. and favors the use of force and coercion to compel white school children to mingle intimately with negroes. 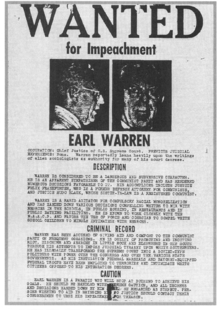 "Description" in an anonymous "WANTED : for Impeachment" poster (1958). "Criminal record" in an anonymous "WANTED : for Impeachment" poster (1958). This page was last edited on 20 March 2019, at 18:45.